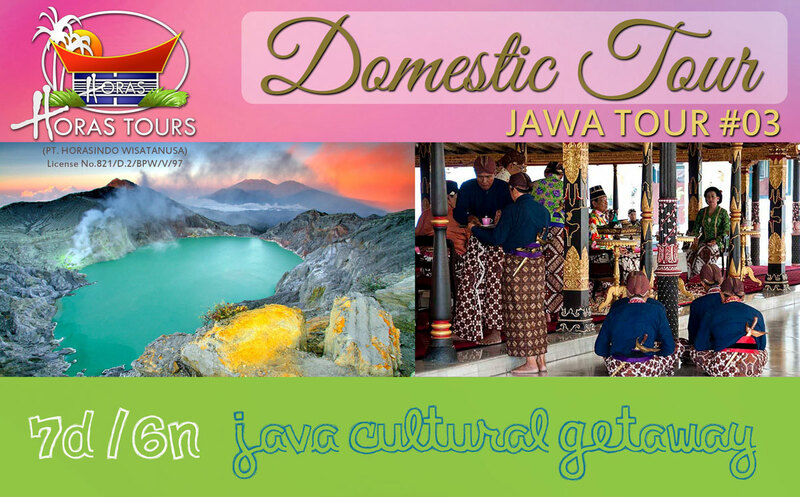 Java Cultural Getaway Duration: 7D-6N Blackout Dates: 3 – 7 July 2016 (Idul Fitri) Have time to explore more of Java? We’ll take you on the comprehensive Java Getaway starting from Central Java all the way east to Bali as your final drop off. Prepare yourself for an inspiring visit to the best of Java highlights as we take you to the World Heritage Borobudur & Prambanan Temple, mystical Dieng Plateau, majestic Mount Bromo, the lovely city of Malang and fascinating Ijen Plateau. DAY 1: SOLO TO YOGYAKARTA Arrive at Solo – Sultan Palace - Yogyakarta Upon arrival at Solo Airport, our guide will welcome and bring you to visit Mankunegaraan Sultan Palace in Solo. (Only possible by arrival at Solo with the morning flight of Silk Air). Afterwards, we’ll transfer you to the hotel in Yogyakarta by car. Relax in the hotel or take the time to explore the city on your own – it’s your free time! We recommend checking out Jalan Malioboro, a popular and vibrant shopping street where you can find bountiful collection of batik, souvenirs, antique goods as well as local food experience. DAY 2: CULTURAL EXCURSION Sultan’s Palace (Kraton) – Taman Sari Water Palace – Traditional Market – Batik & Silverware Home Industry - Prambanan Temple After the breakfast, we’ll start your day with a cultural excursion to Sultan/ King’s Palace (Kraton) and the ruins of Taman Sari Water castle. Then experience the lively trade in the traditional market and inspiring visit to see the city’s renowned production of Batik and silver carvings. In the afternoon, visit the famous Prambanan Temple - UNESCO World Heritage site that is the largest Hindu temple site in Indonesia, or as the locals also call it "Loro Jonggrang" (slim lady). Immerse yourself in the story of Ramayana legend as you trace the beautiful relics of Prambanan. Return to the hotel, and enjoy your free evening time. Optionally, you can opt for special buffet dinner accompanied by traditional dance entertainment from the historic Ramayana legend. DAY 3: WORLD HERITAGE EXPLORATION Candi Mendut – Candi Pawon – Borobudur Temple – Dieng Plateau – Menjer Lake After breakfast, be prepared to enjoy one of the World’s Wonder – the Borobudur Temple! We’ll take you on a cultural sight-seeing feast starting from Candi Mendut & Candi Pawon Temple all the way to the captivating Borobudur Temple. Take a walk around the compound and get lost in the breath-taking view of the monuments. Next we’ll travel along beautiful paddy fields on a serpentine road to the mountain landscape of central Java. You will arrive at the mystic Dieng Plateau, which translated as “residence of heaven” at the high of 2.600m. This area is one of the most active volcano areas in Indonesia, rich with history and ancient temple! We’ll then wind down at Menjer Lake and pass by tea estates on the way back to hotel. DAY 4: EN ROUTE TO MALANG Yogyakarta – Railway Station to Jombang – Malang After an early breakfast, check-out from hotel and we’ll be on our way to East Java, Jombang using the train (3.5 hours). Sit back and feast your eyes on the ever-changing landscape of Java, passing through volcanoes and plantations. Upon arrival in Jombang, you will be transferred to Malang city (3 hours drive) by minibus to check in to your hotel. DAY 5: MALANG: LITTLE PARIS OF EAST JAVA Malang – Mt. Bromo After breakfast, enjoy some fresh air as you stroll along the famous tea, apple, and coffee plantations. We’ll then take you for sightseeing tour around the mountain city Malang, where you still can find some ancient Dutch colional buildings. A quick visit to the market after lunch, and we’ll head to Mt. Bromo area and arriving to your hotel around evening time. DAY 6: EXPERIENCE BROMO Mt. Bromo – Ijen Plateau An extraordinary nature discovery awaits you today! Rise and shine early (around 4am), your tour will start on a four-wheel jeep ride to reach the panorama platform of the Mt. Penanjakan (2.770 m). Only from this platform you can experience the magnificence of Mt. Batok (2.440 m), the active volcanoes of Mt. Bromo (2.393 m) and Mt. Mahameru (3.676 m), topped with the spectacular sunrise view, which is the absolute highlight of this tour. Then drive downhill into the huge caldera Bromo crater and we’ll use pony to bring you to the edge of the crate where you can watch the fuming mouth of Bromo volcano. Head back to the hotel for breakfast and check-out. Before noon, we’ll head to Ijen Plateau to check you in the new hotel. DAY 7: IJEN TREKKING Ijen Plateau – Ketapang – Bali Early in the morning, a four-wheel drive jeep will stand-by at your hotel to drive with you through coffee, cocoa and clove plantations around the village of Licin. On the way, you will meet with one of the last rainforests at East Java’s inhabited with various wild animals. Start trekking uphill for approx. 90 minutes to the crater of Ijen. Take plenty of pictures and don’t forget to say hi to the sulphur carriers on your way up who carries up to 80kg sulphur up and down the hill everyday! After reaching the caldera at 2.883 meters altitude, your endurance will be rewarded by the photogenic milky blue lake in the crater surrounded by yellow, sulphurous rocks. Afterwards, transfer to the harbour Ketapang to cross over to Bali and dropped at your Bali hotel.